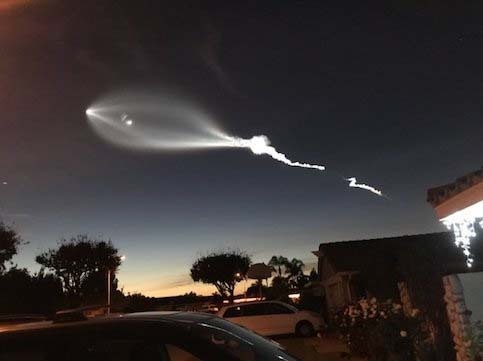 Valley residents are perplexed as to what they saw overhead on Tuesday night, and it didn’t take long for Twitter to catch fire with theories attempting to explain the spectacle. Whatever the object was, those who saw it agree that it was not only blue, but v-shaped and casting what appeared to be blue vapor trails in its wake. Residents in the Phoenix area experienced the most vivid view of the object. It appeared to be heading Southeast, toward the Tucson area. Opinions as to what the object was vary, with some speculating that it was the Falcon Heavy, the most recent SpaceX launch. This, however, occurred at around 3:45 p.m. eastern time in Florida’s Cape Canaveral on Tuesday. Others believe that the rocket’s boosters, two of which reentered the Earth’s atmosphere and landed safely, were responsible. It was later reported by Elon Musk that the third booster, which was set to land on a droneship, crashed. This occurred, perhaps ironically, due to SpaceX’s reputation for safely landing rocket boosters, and then putting them to further use. Among those who believe that the object was indeed SpaceX related, a portion of them attribute the event to have been one of the Falcon Heavy’s multi-staged rocket burns. As multi-staged rockets ascend, boosters become fuelless and are detached, making the rocket lighter and subsequently giving way to the activation of second or third boosters and so on. Perhaps the sight seen in Arizona, could have been one of the Falcon Heavy’s periods of staging. Between this object and the recent Super Blue Blood Moon phenomenon, Arizona residents have certainly been treated to some of the strangest happenings, coming from above.